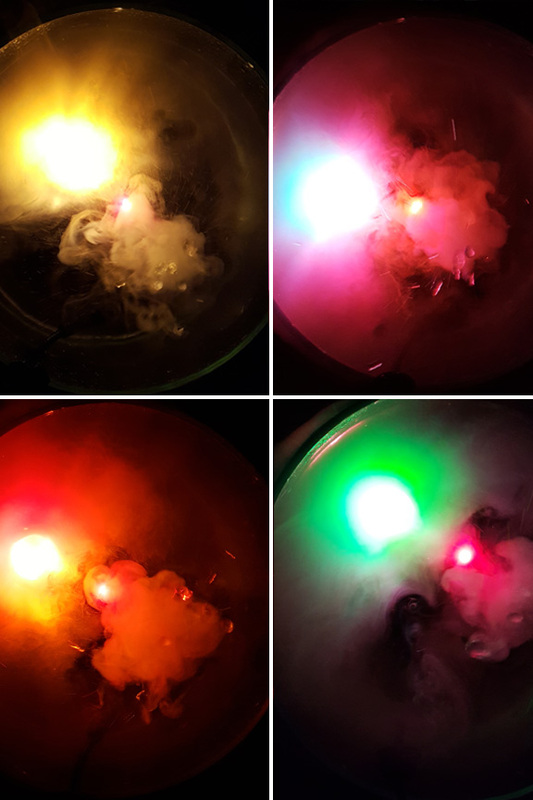 The powerful mist maker has an integrated LED that provides a subtle glow where the fog originates, and the separate halogen light brightly illuminates the water and mist in your choice of colors. With interchangeable lenses, you can keep the glow natural by using the clear one, or you can insert one of the colored lenses to change the light to one of four colors. Once submerged in any container of water, it will create a natural cloud that adds beneficial humidity and negative ions, but you can also add oil to the water, and the mist will diffuse the scent into the air. Use this set to improve indoor fountains you already have, or use it to create your own water feature, humidifier or essential oil diffuser. It works with regular tap water, and it's equipped with a low water sensor that prevents operation when the water level gets too low. Simply plug it in to any regular outlet, and then place under water, and it will immediately begin producing a thick fog that's enhanced by the dramatic lighting effect. Pair this mister with the uniquely designed dual base splash guard holder for the perfect set. It has two openings at the bottom so you can secure the light on one side, and the mister on the other. The vertical holder is positioned in such a way that when you place a dome on top, it will block any splashing water without compromising the lighting effects. 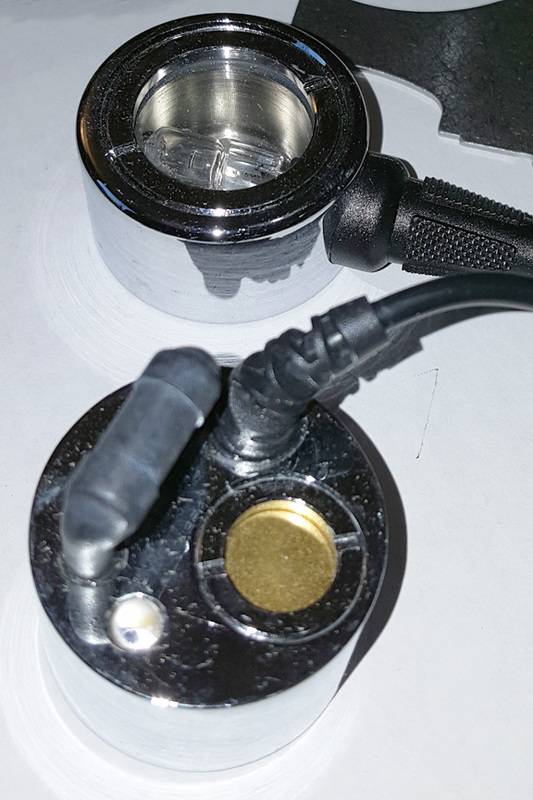 Separate halogen light with interchangeable lenses. The ultrasonic action results in a never ending stream of natural mist. In a short amount of time, a thick fog will cover the water and begin billowing out to mix with the surrounding air. It works well as a cool mist room humidifier, and if you add scented oil to the water, it also performs well as a fragrance diffuser. Thanks to the magical fog production and vibrant underwater light, it can also be used for decoration alone. Place it in a cauldron to create a witches brew, add it to a fountain to improve the visual appeal, or add to a glass bowl to create a fun looking humidifier for a child's room. It can also be used to create a more beneficial environment for plants and reptiles thanks to the dense natural humidity it creates. It does not require any chemicals, and the mist that 's created is nothing more than natural water vapor. A disc at the top of the mist maker vibrates rapidly underneath the water. This action produces enough friction to instantly evaporate water on the surface of the disc. 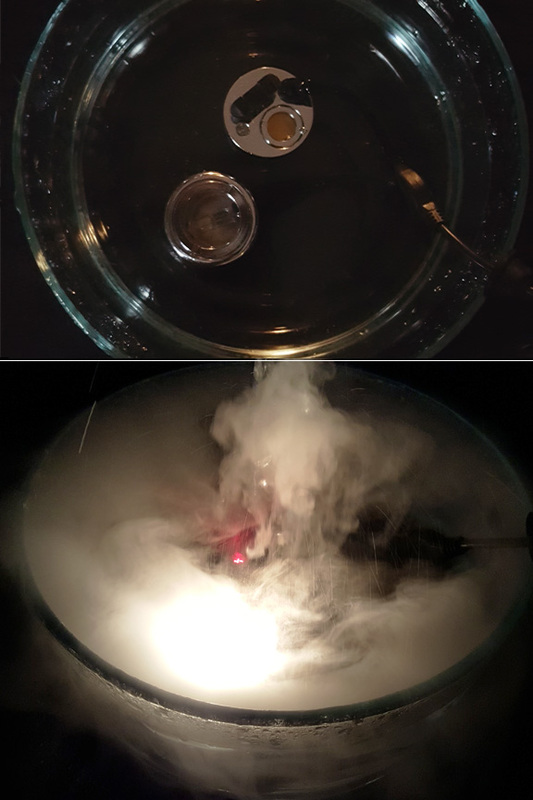 In a matter of seconds, it will start making a thick cloud that covers the surface of the water, and fills any container you place it in. If you add scented oil to the water in small amounts, the fragrance will diffuse into the mist in order to spread around the room naturally. It is a very efficient humidifier, and it also generates negative ions, so it doubles as an air purifier by neutralizing pollen, dust and other irritants in the air. The cool mist is totally safe around children and pets, and it's beneficial for plant life too. Like the solid color, but looking for something more compact? Check out the DP-24 or the the TL-24 Mister. They both have a standard design with integrated LEDs, but the DP-24 has one red light, and the TL-24 has three LEDs in your choice of colors. Prefer to have a multi-colored mister? Check out the CN-24 or the DH-24. It has 9m LEDs in a variety of colors, and it has a controller that allows you to set the mode that you like best. If you don't care about controlling the lights, the DH-24 has 12 multi-colored lights that automatically rotate through several different lighting modes. Mister and Light Spacing 5" cord length between the two units. Lights 1 halogen light - clear or colored. Light Adjustment Interchangeable lenses allow you to select the solid color you like best. 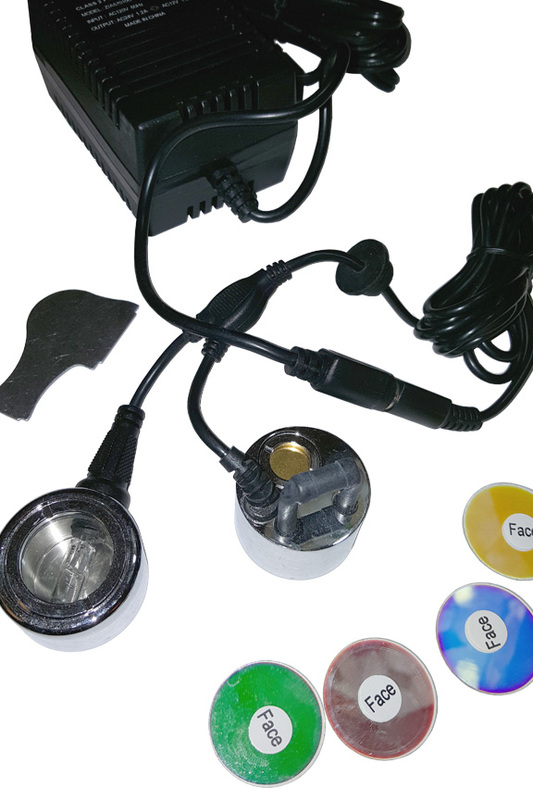 Repair a broken fountain or make your own with this replacement misting device kit. Submerge into any bowl of water to produce a natural cloud of mist that humidifies the room. This dual unit also comes complete with a bright underwater light.Order Yours Today! I recently purchased a DL-24L Mist Maker Light Combo. I am delighted to report that it is amazing. I highly recommend it. It works beautifully, exactly as described. The quality is exceptional and the service I received was first-rate. I received my order within a few days. I am sure this Mist Maker Light Combo will bring me many years of wonderful service. Thank you Simply Good Stuff! The first unit stopped working within a few days, but because of the excellent customer service, a new one was sent right away. The replacement works great. I wanted this one because it has a white light that does not change colors. These guys are great!! !